Datsun has revealed sketches giving a preview of the first new-generation Datsun car before its global premiere on July 15. Millennials who were born between 1980-2000 likely won’t remember the Datsun car. But those who are older remember the last Datsun cars before Nissan phased out the brand in 1986. Now the brand is being resurrected around the globe and Datsun has revealed the first sketches of what the new Datsun car will look like. The first Datsun car will be launched next year and the brand will come alive again as the future model line-up is introduced in 2014. When will the world see the first car? 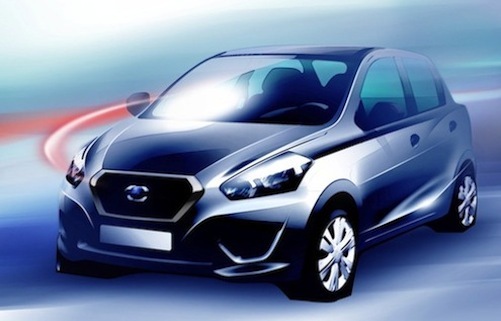 Datsun will make its world premiere in New Delhi, India on July 15 at a special event for the new car. Datsun tells us the brand will primarily focus in the new emerging markets of India, Indonesia and Russia in 2014 to be followed by South Africa later in the year. Not much information on the new car has been revealed, but the new Datsun looks like it will be geared toward “up-and-coming customers” and will be a small compact that will be fuel-efficient. The Datsun launch next year will be a significant milestone and a new chapter in the history of this legendary brand. Nissan says the new Datsun compact design will feature many new models and will follow a common inspiration in the different global markets. It sounds like the cars will be smaller, sporty and offer an engaging driving experience. For those who remember the Datsun’s of old, like the 240Z, they will follow a sporty tradition. The 21st century Datsun should be competitively priced and offer younger buyers a car that has value and the quality of the Nissan brand. Each market will have the Datsun cars manufactured locally and will be supported by the existing Nissan network. Vincent Cobee, Head of Datsun said in the announcement, "Datsun will bring competitive products and services, modern and aspirational, while at the same time reassuring, providing superior value and specifically developed for the emerging and ambitious new Middle Class in high-growth markets. The Datsun cars will be locally developed with the support of Nissan Motor Company engineers and stylists and will be locally produced." Will we see the new Datsun cars sold in the U.S.? The Japanese automaker says the brand will revive the Datsun brand and would help it gain market share in high-growth markets around the globe. That probably leaves the North American market out of the mix. For more information, Datsun has launched a new website, Datsun.com. Brand and product information will be available after July 15th. Watch Nissan’s Carlos Ghosn Q&A on Datsun’s Return video.